Are you feeling a little bit angsty? Are you looking to start a rock band with your (equally unwashed) buds in your parents’ garage? Are you trying to find the perfect accessory for all that plaid flannel? We get it, you’re a child of the 90s! 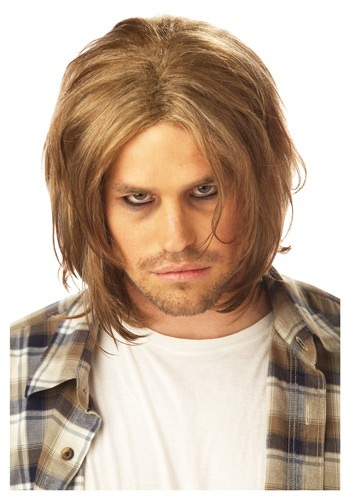 Time to throwback by throwing on this Grunge Mens Blonde Wig and do your best Seattle rocker impression. All you need to do is heavily line your eyes, grow some scraggly facial hair, mumble all of your lyrics, be really wobbly, kick over your amps, and then stage dive. Sounds easy, right? Oh, and please don't forget to be totally apathetic and to raise your fists to major corporations. Now, friend, you're certified grunge...not that you believe in labels. And you’re totally on point for Halloween...not that you care at all. Was great for the price!